On the 12th January Lord Robertson of Port Ellen hosted a debate “that this House takes note of the future capability of the United Kingdom’s armed forces in the current international situation”. The Bishop of Portsmouth, the Rt Revd Christopher Foster, highlighted the need for a new Strategic Defence and Security Review, alongside recognition of new partnership and leadership roles. 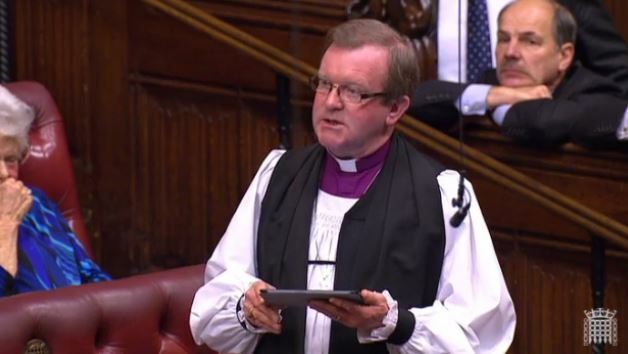 The Lord Bishop of Portsmouth: My Lords, agree with it or not, Brexit was a decision to determine our own path. This debate requires us to consider critically whether we have the capacity to determine our own strategic path in the realm of defence and security. The extent of our global reach must reflect our economic and strategic interests as well as our security and military concerns in these changing times, which now make these considerations, as one analyst has put it, “supercharged”. My anxiety is that there is a gap, if not sometimes a gulf, between rhetoric about our concerns and ambitions on the one hand and our constrained capability on the other. On the 9th January 2017, the Bishop of Portsmouth, Rt Revd Christopher Foster, led a short debate in the Lords, to ask the Government “what is their assessment of the role of the Armed Forces Covenant in ensuring that those who serve or who have served in the Armed Forces, and their families, are treated with fairness and respect.” Earl Howe, the Minister of State for the Ministry of Defence, responded on behalf of the Government. Both their speeches are reproduced below in full. The speeches of other Members in the debate can be read here. On 23rd May 2016 the Bishop of Carlisle, Rt Revd James Newcome, spoke in the second day of debate on the Queen’s Speech. He focused his response on the Government’s proposals to tackle tax evasion and extremism, as well as calling for a renewed focus on international development and the military covenant. The Minister of State for the Ministry of Defence, Earl Howe, responded on behalf of the Government.